Mention “influence marketing” today and it’s a good bet that the majority of people will think of social scoring platforms like Klout, Kred and PeerIndex. These early movers in the influence space have carved a niche for themselves and the brands they’re looking to work with, by attempting to provide data on who the most influential online users are. By connecting brands with these online influencers, the hope is that brand’s message will be amplified to the Nth degree and more awareness around the brand will ensue. However, a new report based on a global survey of 1,3000 marketers, PR professionals and brand managers/agencies highlights brand awareness as being less of a goal when it comes to influence marketing. Instead, lead generation and customer acquisition are much more important, and where brands are allocating their budgets in the next 12 months and beyond. The report also shows that social scoring platforms lack trust and authority when it comes to the very people these platforms are looking to work with. There are a few key insights that the report provides, from how influence marketing is perceived today to how effective those using influence marketing as part of their overall strategy perceive today’s more popular platforms. However, it’s the fact that influence marketing is seen as a lead generation and customer acquisition tool that stands out. It also lends weight to why scoring platforms like Klout, etc, come under fire for the lack of results (perceived or actual) when used as the influence marketing tool of choice. As shown by the image above, almost 44% of respondents see influence marketing as a lead generation tool, with almost 25% seeing it as a customer acquisition tool. Just over 16% see it as a branding exercise. With social scoring platforms like Klout (currently) not sharing the kind of measurement that shows what leads and customer acquisition their client promotions have resulted in, it leads to another concern for marketers – how effective are these platforms? This is reflected in the survey responses, with more than half feeling today’s scoring platforms aren’t effective at identification of the type of influencers that can drive leads and customer acquisition goals. Additionally, more than one fifth felt the results were too varied, with only 5% of respondents believing today’s scoring approach to influence were effective for their goals when starting a campaign. While not every influence marketing campaign needs to drive sales all the time, the fact of the matter is brand awareness doesn’t pay the bills nor drive profit. Blog posts and social shares are nice to have for social proof, but businesses are placing success metrics on the financial and customer return influence marketing campaigns drive, not X amount of social network updates. While the report shows there’s a clear gap between what PR/marketers see as the strategy and the results generated by scoring tools, it also shows that they clearly differentiate between “social scoring influence” and “influence marketing”. As the above figure shows, almost 2/3 of all respondents identify social scores as simply a starting point in their campaign – they still see the need to filter through the results manually and filter the most relevant influencers. 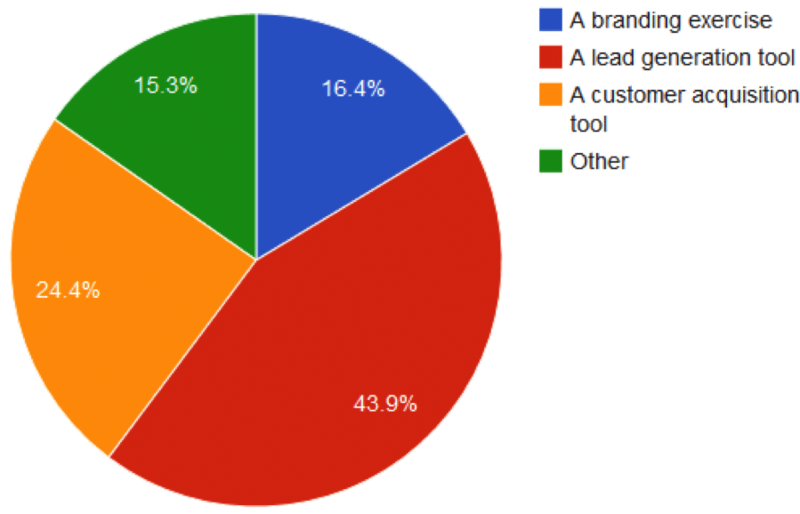 Additionally, almost 20% use scoring as part of a bigger marketing strategy and not as a standalone tool. 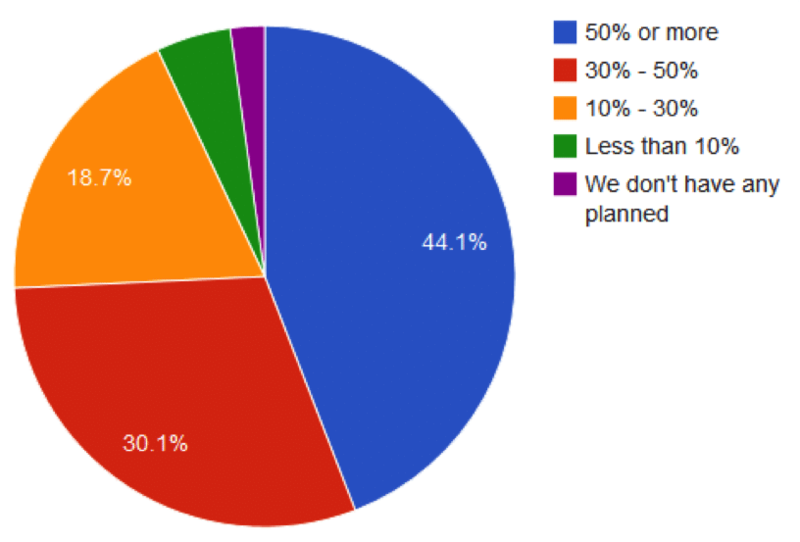 Less than 5% use scoring as a key part of their overall strategies and tactics. 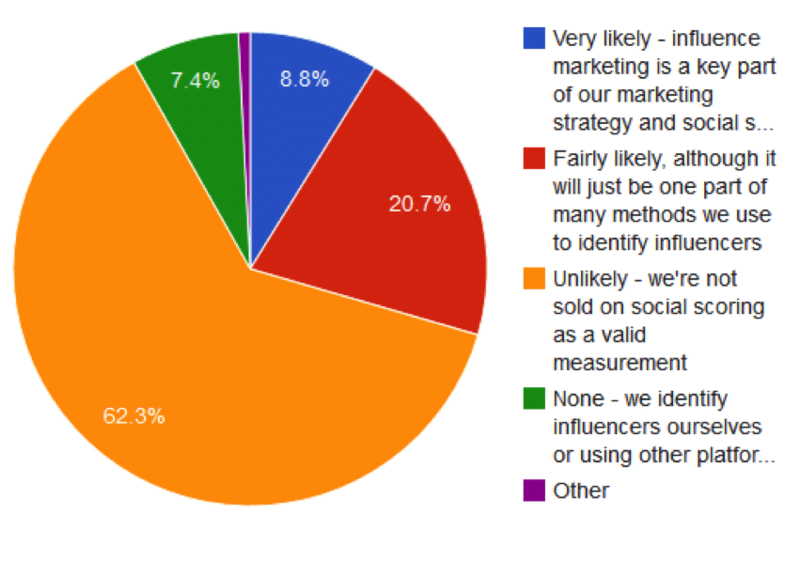 This ties in perfectly to further data from the report, when discussing how whether they’ll be using influence marketing, and how much of their marketing budgets are being allocated for the next 12 months and beyond. According to the report, almost half – 44.1% – will be creating an influence marketing campaign in the next 12 months, with just over 30% indicating the likelihood of using influence marketing as part of an integrated strategy. When it comes to actual budgets, however, there’s a clear gap between how much will be allocated to “social scoring” and how much will be allocated to actual “influence marketing”. The figure above represents how many respondents will use social scoring as part of their influencer outreach. Almost two thirds say it’s unlikely, as the methodology is not seen as a valid identification/measurement tool. 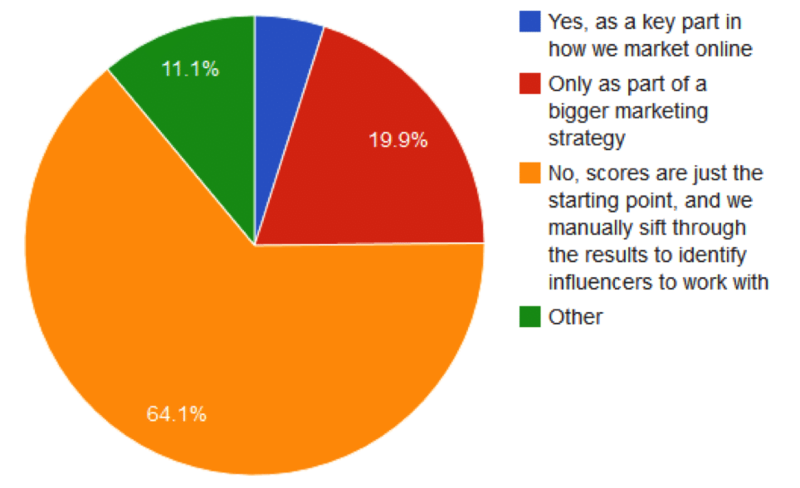 Just over one fifth will use scoring, but only as part of a bigger strategy, while less than 9% are sold on scoring as a key part in the influence marketing arsenal. The full report makes for some pretty interesting reading overall, but it’s the takeaways shared in this post that I find to be particularly illuminating. While I’ve personally questioned the value of social scoring when it comes to true influence versus online popularity and amplification, it’s been seen from a biased bubble, if you like. The survey carried out by Sensei Inc. and ArCompany was open to anyone to complete, although they had to be representative of marketing, PR and communications disciplines. Over 1,300 respondents from across the globe represented a good mix of professions and business functions. In fact, business-to-business (B2B) was serviced just as much as business-to-consumer (B2C) markets – another interesting statistic, given social media’s penchant to be more acceptable in the B2C market. Because of this mix, the results took me completely by surprise when it came to how scoring was perceived by the very professionals and verticals these platforms are hoping to sell their services too. Yet perhaps I shouldn’t have been as surprised. As both Sam Fiorella and I have found, in numerous interviews and research for our imminent Influence Marketing book, we’re moving beyond today’s approach of amplified distribution when it comes to influence, and into true, measurable and actionable data, metrics and identification of true influence. While scoring may continue to be popular when it comes to consumer awareness and where people stand with their score on these platforms, the business decision-makers are looking for more tangible results. That bodes well for the future of influence, and for businesses working in this space. Here’s to the next wave. You can access the full report here. A version of this post originally appeared here. janlgordon ArCIntel DannyBrown Great article that is backed by thought and data, looking forward to the book! DannyBrown janlgordon ArCIntel Good that the scoring sites haven’t eliminated interest in spite of being “gamed” sometimes! DannyBrown janlgordon ArCIntel Very true – they’ve opened the gates in many ways, hope they continue to evolve and improve!